The sunset hues leave the horizon painted in yellow and orange hues while the clouds thicken over the town of Perce, Perce Rock and Bonaventure Island in the Gaspesie Peninsula in Quebec, Canada. 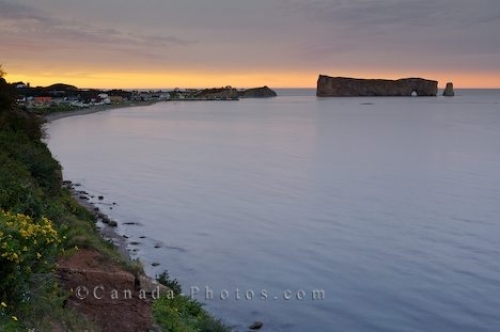 Perce Rock is a famous landmark which brings in thousands of tourists to the small coastal town of Perce. Perce Rock and Bonaventure Island are easy to reach when the tide is low, but many like to view these natural phenomenons by boat. Gannet colonies, puffins and other bird species make Bonaventure Island home while nesting and breeding where they soar from the cliff which reaches about 250 meters in height. Perce Rock is a large limestone stack and extends 1,420 feet in length, 296 feet wide and 289 feet at its highest point. At the end of Perce Rock, closest to Bonaventure Island, there is a large, high arch which is 50 feet high and can also be explored at low tide. Picture of a beautiful sunset over the town of Perce, Perce Rock and Bonaventure Island in the Gaspesie Peninsula, Quebec. The town of Perce was once an important fishing centre, but due to these natural tourist attractions, tourism keeps the economy alive. During the sunset hours, this region in the Gaspesie Peninsula in Quebec becomes a paradise for photographers.